Flat roofs are a brilliant way to add extra usable space to your property and we are on hand to help you every step of the way. Whether your roof needs repairing or replacing, we offer impartial, honest and expert advice on what your roof needs and how to efficiently achieve your dream result. Our team of technicians are fully qualified and experienced in working with all sorts of different flat roofing materials, from felt to lead. Here at Chris Ball Roofing, we feel that roofs should be built to last, which is why we exclusively offer traditional materials and methods with proven longevity. Your roof should be an investment that lasts years, which is why we focus on tried and tested techniques. Our Specialist NVQ-trained felt flat roofers use only the best quality torch on felts available. Based on an ancient roofing method, modern-day techniques have created an exceptionally durable polyester-based felt that can withstand both extreme weather and regular use. Felt roofs are universally seen as some of the most long-lasting available, featuring guarantees of up to 20 years. You deserve a roof that you can install and leave, safe in the knowledge that it was built to last. Our high performance felt offers exactly that. Acrypol coating is an all-weather, waterproof roof coating product. It was originally developed to refurbish failed industrial, commercial or domestic flat roofs but is perfect for adding a new level of durability to your property. We feel that your roof should be made to last, which is exactly what Acrypol coating was made to achieve. It offers a long-term solution to waterproofing problems in buildings and can be applied to a variety of roofs in multiple different weather conditions. Lead is an extremely resilient metal, boasting corrosion resistance from both traditional weathering and radiation. Saying that, it’s well-known that lead can be harmful, which is why every one of our lead flat roofers has undergone four years’ worth of training, ensuring a high-quality, L.D.A. compliant finish. Lead roofs are some of the most durable and long-lasting available. With lifespans of over 100 years, this is a roof that you can trust for the foreseeable future. We pride ourselves on offering the perfect combination of expertise and honesty. We offer a bespoke service, tailored to you with your needs at the heart because our customers are what drives our business. Our work is methodical, detailed and comprehensive with a single goal in mind – creating a long-lasting roof to protect your property. Many other London roofing companies specialise in a single flat roofing technique and so push their potential customers to select this type. At Chris Ball Roofing, we are multi-disciplined with experienced roofers in a variety of materials and methods. This enables us to offer a completely impartial service, advising you based on your needs and your goals, rather than for our own gain. 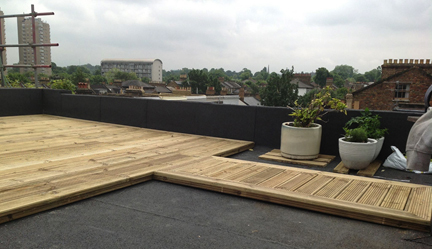 If you’re looking for a flat roofing solution based in London, then get in touch with us and a member of the team will be pleased to talk you through the options.